Line a muffin tin and fill the cups with broken crans. Get your little helper/aspiring hand model to help you. Try to convince him that you're not really making cupcakes and that you're not going to eat what you're making. Good luck with that. Bake until the cran pieces are melted, about 15ish minutes. Let tins cool and pop crans out of the liners. This is satisfying like unwrapping a Reese's peanut butter cup, only not as tasty. Then color 'til your arms fall off!! I made mine in a mini muffin tin so they would be smaller and thicker, making them easier for a certain little boy to use, but of course this would work great in a regular tin, too. Oh my gosh that is soooo cute! I totally want to try that!! Saw ya on SITS...come over and say hi anytime! this also works with leftover chunks of candle wax. 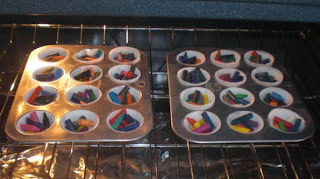 instead of crayons you get tarts! I did this sometime last year for my son's little girl friends! Love this! And the mini-muffin pan - how smart. Molds! I love that idea! What a fun idea. I normally just look at all the broken crayons at the end of the school year, and throw them away so I can start fresh. Broken crayons are one of my pet irritations... perhaps I need to deal with those issues. Ha! Thank you for stopping by my blog!! Looked around on yours a little bit. I LOVE your kitchen redo....especially the arched doorway!! Look forward to following you! Cute idea. Stopping by from SITS. I like to think I'm cool too by the way! Use them to color pieces of cardboard that are destined for the trash. The texture makes the colors come out really well. I DID THIS WITH MY KIDS WHEN THEY WERE LITTLE--VERY FUN! I USED OUR "CRAN" (I'M WITH YA ON THE PRONUNCIATION!) BITS FROM HOME AND MY CLASSROOM. NEXT TIME YOU CAN PUT A MARBLE OR BALL OF TINFOIL IN THE MUFFIN TIN ON THE OUTSIDE OF THE PAPER--WHEN IT COMES OUT, THE INDENTATION MAKES IT LOOK HEART-SHAPED! FUN FOR VALENTINE'S DAY AND FOR CLASSROOM FAVORS! oh my gosh! Sooo cute.